Lunar Lanterns have been installed around Circular Quay to celebrate the Sydney Lunar Festival. In the Chinese zodiac, every year is symbolised by an animal and this year is the Year of the Pig. 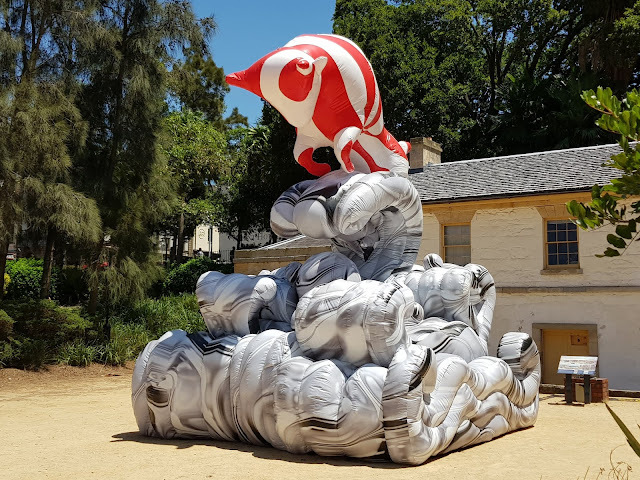 The forecourt of Cadman's Cottage at The Rocks features this lantern created by Lauren Tan. It has two cyphers in Chinese heritage, the Ox and the Scholar Rock, emanating as one in a symbolic "surge of strength and knowledge". The zodiac symbol of the Ox is known for its diligence, dependability, strength and determination. Linked to: Wordless Wednesday, Over the Moon. Happy year of the Pig. These lanterns look like fun to see.